I must admit that I have lost track of what Marillion has been doing since "Marbles" (2004). So I started to read up on the time and albums I missed out on, and it turns out; I really didn't miss out on a lot. 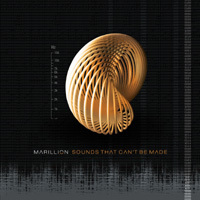 And as it turns out; the connecting from "Sounds That Can't Be Made" to the past is somewhere between two of their better albums: "Afraid of Sunlight" and "Marbles". I've been a fan of Marillion for ages, but I do tend to go back to the same two albums all the time: "Brave" and "Clutching at Straws", which in my opinion represents the best moments of the two faces of Marillion. Yes, I know many will call it sacrilege to pick "Clutching at Straws" ahead of "Misplaced Childhood" from the Fish era, but I have always felt that they reached their peak there, just before the break-up. And they needed a few years to fully integrate Steve Hogarth before the "new sound" was firmly established, which I think they succeeded with, with their 1994 album "Brave". Back to studio album number seventeen, which like any prog album needs its spins before really opening up and starts showing it's true colors. With such an extensive back-catalogue they surely have a lot to live up to, and they prove just why they belong among the most influential British prog rock bands around; diversity and innovation have always been cornerstones in their sound and the eight songs on this album continues that trend. The three epic tracks mark the highlights on this album, but the rest is not far behind and all-in-all they have produced an album that ends up in the better half of their releases.